Note: Although I have never been attacked or called a coward concerning a political or controversial topic, I appreciate Karl Vaters perspective given here. Idon’t speak on political issues in my church. I never take a side on controversial news items when I’m behind the pulpit. On behalf of myself and many Christians like me, I’d like to make a request. Stop accusing fellow Christians of doing nothing just because we’re not called to do what you’re called to do. 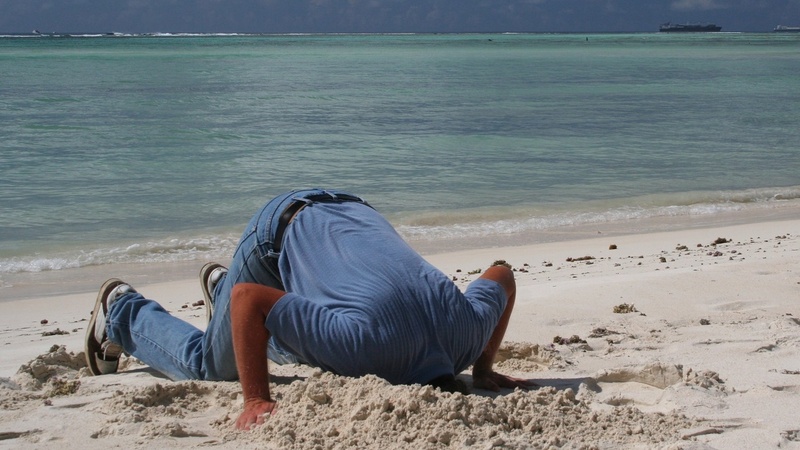 We may not preach on political issues, but that doesn’t mean we’re sticking our heads in the sand. There are other options. I’m not a wimp in the pulpit. Preaching from scripture often means taking an unpopular stand on hard moral issues. Sometimes those stands correspond with current affairs. Sometimes they highlight problems we’re ignoring because we’re being distracted by the shiny sin-bauble currently in the news. When I preach, I try to take my cue from God’s Word, not the current obsession of the 24-hour news cycle. But I know what’s coming. The next election will be called “the most important decision of our lives.” The next (or current) moral issue will be labeled “a defining moment for the church.” I’ll get phone calls, emails, Facebook pleas and drop-bys from people with flyers, petitions and upcoming rallies they want me to promote. or part of the problem (my personal favorite). Just because I’m not responding to the current cultural/moral/political/social issue the way some people think I should, does not mean I’m ignoring it. Recently, a bunch of pastors were having a heated, yet civil Facebook discussion on a moral issue. Several were decrying the silence from our pulpits on it. I commented that I don’t mention it from the pulpit because we’re ministering directly to people who are suffering from it. The response was strong and fast. Caring for individuals is fine, ​they said, but we’re not changing things unless we denounce it regularly from the pulpit. Almost everyone dismissed the idea of caring for hurting people with an electronic wave of their hands because they wanted to get to the “important” task of preaching about it, instead. But Jesus never did that. He didn’t discuss politics unless he was dragged into it. And, even then, he sidestepped their political angle and stuck to his agenda. Jesus never allowed others to define what mattered. He made them come to him. He wasn’t distracted by the controversial issues of the day – and there were plenty. Instead, he took care of people. When the disciples dismissed a group of kids so they could discuss big-picture issues, Jesus rebuked them, put a child on his knee and told them this is what the kingdom of God looks like. Not everyone who seems to be quiet about evil is actually being quiet about it. For instance, in World War II many wore uniforms, took up arms and bravely fought against the evils of totalitarianism. Meanwhile in Germany, Oscar Schindler ran a factory supposedly making ammunition for the Nazis. In reality, he was leveraging his reputation as a Nazi collaborator to undercut their efforts, while saving the lives of hundreds of Jews. If he had spoken out politically, he would not have been able to save those people. The French underground worked in a similar way, by silent subterfuge. Those who hid thousands of Jews, like Anne Frank and her family, did the same thing. Their silence was not compliance, it was an essential element of their strategy. While I am certainly not in the same category as those heroes, the truth is that there are many in the current culture who are doing something similar. I know some bold culture warriors who are often accused of not taking a stand because they are not making broad statements. But it’s their apparent silence that allows them to make a big difference in some very personal, private ways. We’re not all called to respond to every issue in the same way. As Paul taught, some are eyes, others are hands. And the eye can’t tell the hand it’s not doing the right thing just because it’s not acting like a hand. If you’re called to speak on big issues in public forums, go for it. But don’t criticize those who are called to be change-makers in different, less visible ways. If you’re called to respond to today’s issues in a more private and personal way, do that with all your heart. And don’t let anyone make you feel guilty for it. But, by all means, do something. If we all play our part without criticizing the other parts, we may be amazed at what a unified body, inspired by the Holy Spirit, is able to accomplish. Copyright © 2015 by the author or Christianity Today/Leadership Journal. Click here to contact me concerning reprint permissions. This time of year is fraught with inaccurate and dangerous messages for high school graduates ‒ and for that matter, college grads ‒ about their futures. It is a message that is rooted in the same flawed logic that makes executives focus on making their companies smart while ignoring the more important issue of culture, or organizational health. There are two primary fallacies that need to be debunked here. First, a person’s job does not determine his or her happiness in life. It took me many years to figure this out, as I initially bought into the notion that the prestige of my career and the money I earned were the foundations of success. For those who think this sounds naive, know that most of the young people leaving high school and college are under the impression that this is the case. The result of this is a failure to appreciate more important determinants of fulfillment in life, like marriage, friendships and faith. It’s critical for young people, and their parents, to realize that their college experience has a far broader impact on their life than on their career opportunities. Unfortunately, schools are not rated based on how they shape a person holistically, and so we fall back on careers and salaries as an indicator of quality. This leads to poor decision‒making and seriously unrealistic expectations for students and parents alike. Second, even if one were to believe that college is primarily about getting a great job, there is no reason to believe that going to a higher rated school leads to greater success in one’s work life. As someone who has been working with leaders for twenty‒five years, I can say with confidence and sincerity that the vast majority of the best executives and employees I’ve encountered did not go to the most prestigious schools or have the highest S.A.T. scores. In fact, what the successful ones have in common has little or nothing to do with their educational background or raw intelligence, and almost everything to do with emotional intelligence, character and work ethic. Trust me when I say that most executives will wholeheartedly agree. So why does society put so much emphasis on numerical indicators like test scores, grade point average and school rankings? For the same reason that businesses focus on finance, marketing and technology ‒ those things are easier to measure than the benefits of organizational health. We human beings seem to crave concrete, measurable predictors of success, perhaps to give us a greater sense of control in the world. But that doesn’t make those predictors accurate indicators of anything. Success, fulfillment and happiness in life are driven by a more integrative, nuanced and behavioral combination of factors, that can’t be easily captured on a spreadsheet. So what is the message for parents and students? First, don’t buy into the lie that success and fulfillment in life are determined by the prestige or ranking of the college you attend or the job you land. Second, take a more holistic approach to life as the best leaders do, embracing attitude, behavior and effort more than intelligence and status. And finally, when it comes to searching for a college or a job, find the one that will allow you to develop your character and social skills so that you become the best husband, wife, parent, neighbor, and yes, employee you can be.